AN afternoon of blogging talk can be a challenge to the most committed internet junkie, so after delivering a presentation on starting a blog-style website today some attendees asked if I could mindmap my talk. So here is a simple map of some of the key tools and techniques to be aware of that I think will get you off on the right foot, but also here is a page of del.icio.us links that feature some real world examples and tips. 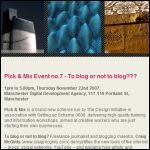 I WILL be laying out my four years' experience of blogging, and more than ten years of working online, at a talk next week in the centre of Manchester. Titled To Blog or Not to Blog??? the free and easy talk will go through the basics of setting up a blog, and what many of the different terms mean, such as Permalinks and RSS, but more importantly how they will help your site. I hope people will come with plenty of questions so that I can point out possible solutions, but this format also lets others share their knowledge and possibly link up on future projects. Although I won't say what you need to be aware of I think you will be able to guess that it relates to paying the gas bill. Many sites use Google Analytics to track site visitors, but the wealth of info can be mind blowing, this will help you get to the most useful stats. Important advice for those people with UK sites that have a .com domain name and are hosted outside Britain. Social networking: opportunity, not threat, to "old media"
Robin highlights how the BBC uses many of the social tools already out there to promote the work of journalists beyond the Beeb's site - it ain't that hard.